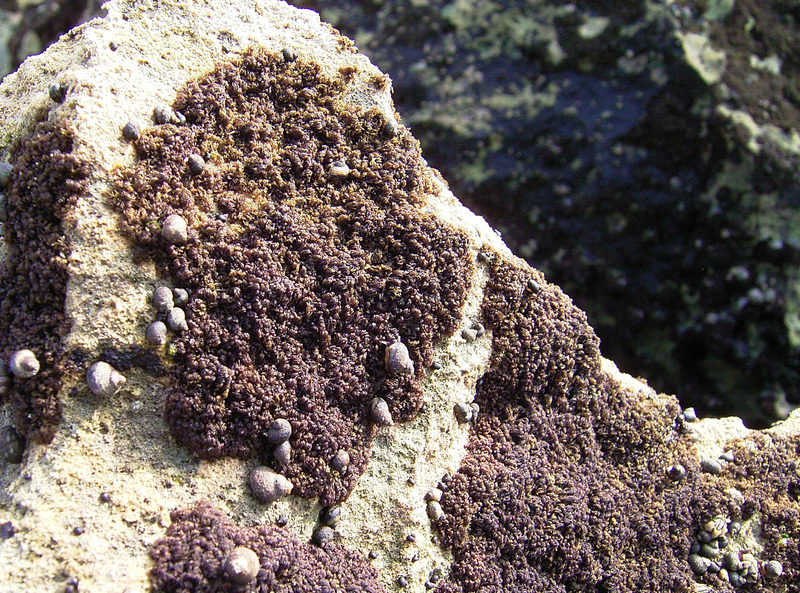 Plants blackish, forming dense woolly cover or tufts on rocks and in crevices at high tide level. Tufts 0.5 – 2 cm tall, with prostrate and upright axes. Polysiphonous throughout, segments usually with eight pericentral cells that divide transversely into 4 (-5) tiers of square or hexagonal cells with thick cell walls, further cortication absent; filaments up to 150 µm in diameter; young branch apices incurved. Branching in erect axes alternate, often every second segment, laterals usually not branching further. Tetrasporangial stichidia rather incurved, terminal on lateral branchlets, attenuated cone-shaped, ca. 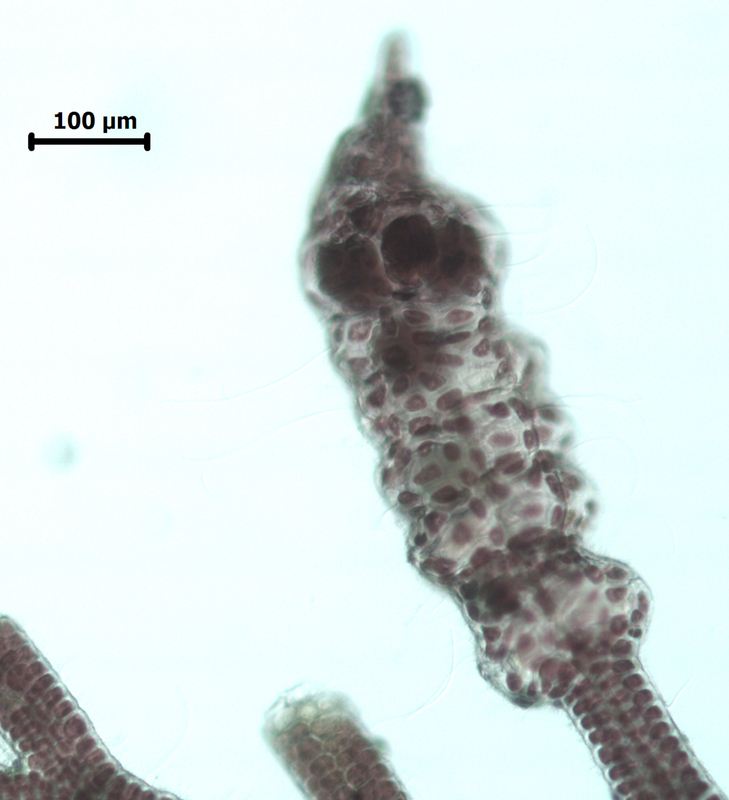 500 µm long, 150 µm wide. Stichidial segments with five pericentral cells, usually three bearing tetrasporangia and two remaining sterile and dividing as in vegetative axes. Fertile pericentrals cutting off tetrtasporangium and three uniseriate groups of cover cells: one central 2-3 celled group and two lateral 4-6 celled groups. 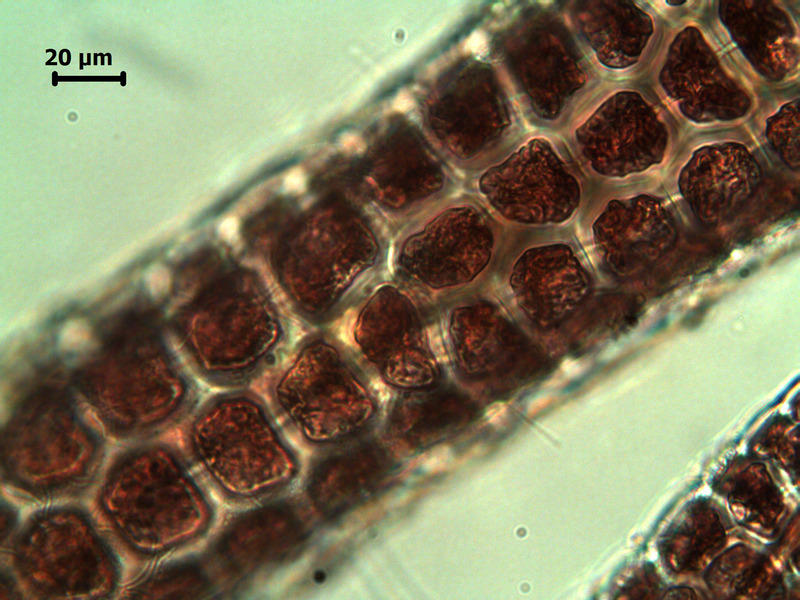 Tetrasporangia to 60 µm diameter. Sexual reproduction not seen. Recorded from Kommetjie on the west coast along the entire south coast to the Port Edward area of KwaZulu-Natal (24-47). Common on shaded faces and in crevices on rocky shores at high tide and in the splash zone. World distribution: Fairly widely collected from various parts of the world, but on the African continent only recorded from South Africa (Guiry & Guiry 2010). 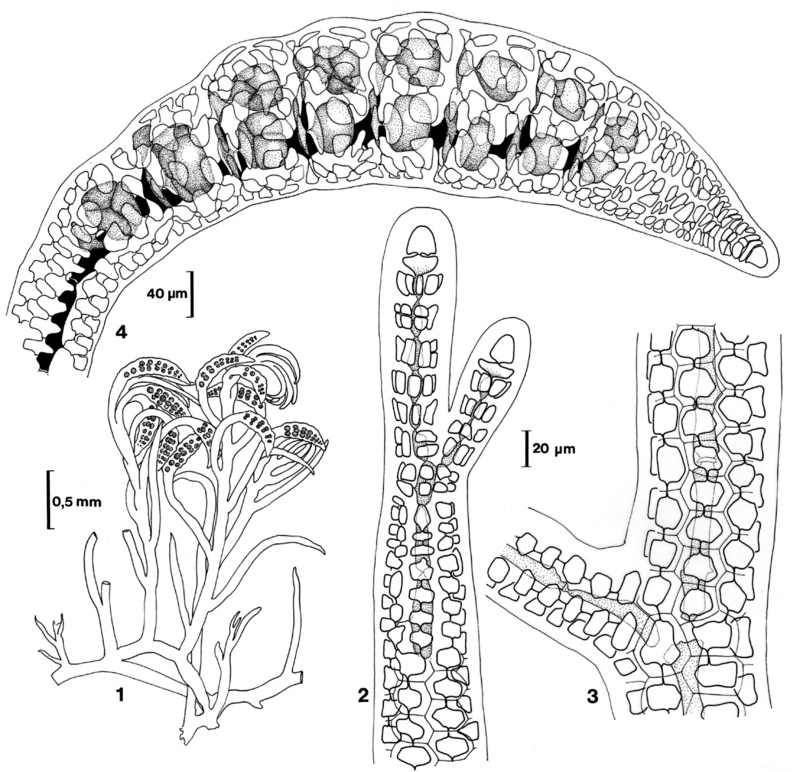 Type locality: Falkland Islands (Silva et al. 1996). Bostrychia intricata, curved tetrasporangial stichidia. Bostrychia intricata, cells of fresh material. Bostrychia intricata, young tetrasporangial stichidium. Bostrychia intricata. 1. Habit, tetrasporangial plant. 2. 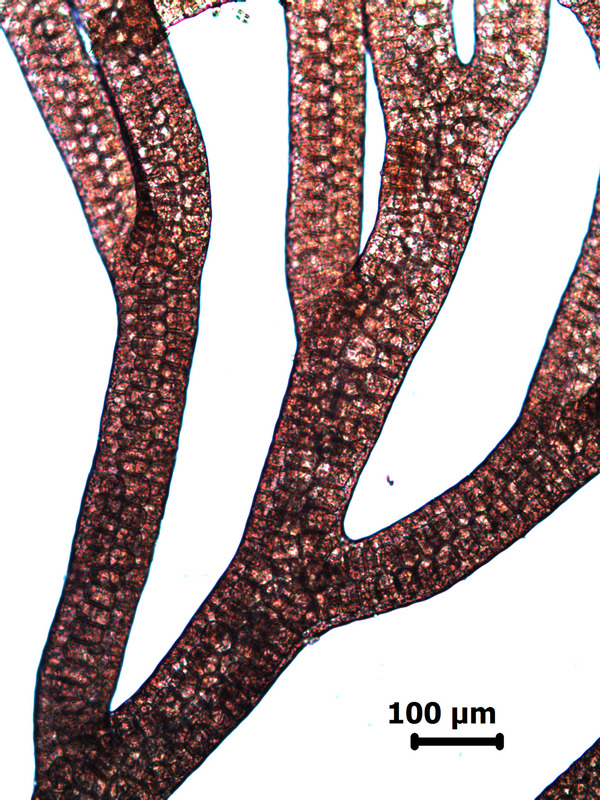 Thallus apex. 3. Detail, showing central cells and divided pericentral cells. 4. 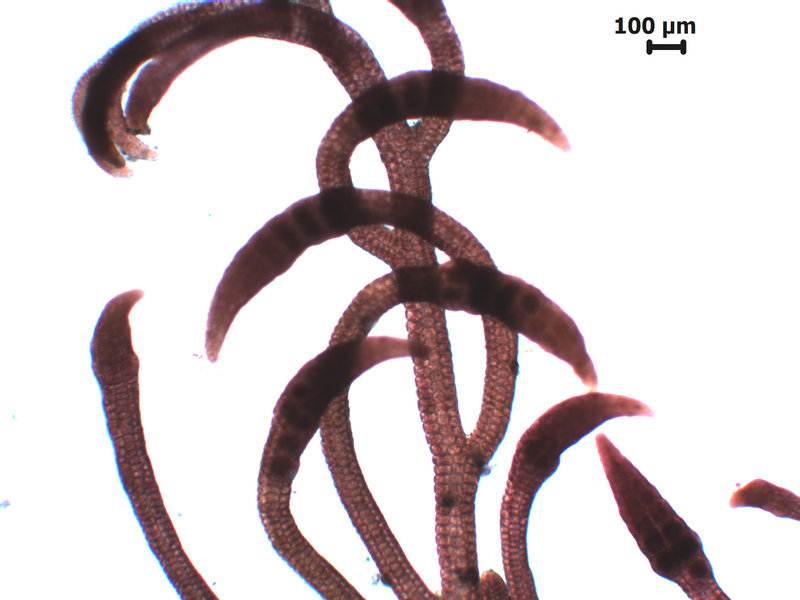 Tetrasporangial stichidium (central filament black). Reproduced from Stegenga et al. (1997). Montagne, C. 1852. Diagnoses phycologicae, seu quibus characteribus, discriminandae sunt species lichenum algarumque nonnullae novae, in tomo Florae chilensis octavo nondum typis mandato descriptae. Annales des Sciences Naturelles, Botanique, sér. 3 18: 302-319.